Parsi Times is delighted to share the great news of 18-year-old, dynamic college student, Ashoi Dantra from Jer Baug, Byculla, who is currently representing India in the prestigious ‘World Teen Supermodel Pageant’, that is taking place over an 8-day global platform (31 March to 7 April, 2019) in Fiji, under ‘The World Supermodel Production and International Fashion Week’ Competition. Designed for models between ages 16-19 years (Teen Category) and 20-30 years (Adult Category), the Pageant was created to select the next ‘Teen’ and ‘Adult’ ‘World Supermodel’. 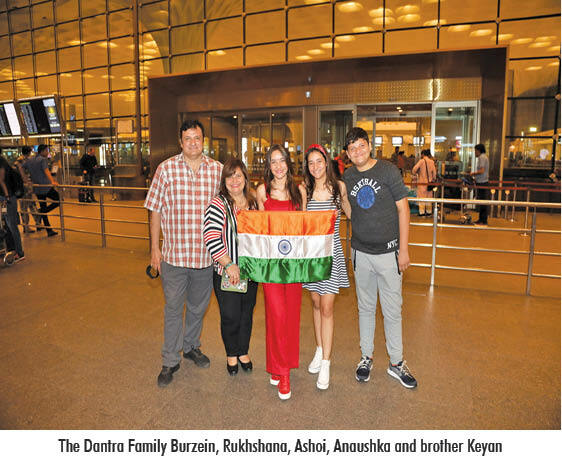 The daughter of Rukhshana Dantra and Burzein Dantra, Ashoi has an identical twin sister – Anaushka and both of the darling beauties have been child-models since the age of three, and have appeared in numerous advertisements and serials on TV, mainly as twins. A Science student from K C College, Ashoi won the ‘World Teen Supermodel – India’ contest which was held in Mumbai last year on the 26th of August, at Y B Chavan Auditorium. As is the case with most twins, Ashoi and Anaushka share a number of activities – both sisters are into sailing and having completed their professional sailing course, are now sailing instructors at the Royal Bombay Yacht Club (South Mumbai). They are also football enthusiasts and are part of Bombay Gym’s football team. Given a chance, Ashoi wants to make it as an actor and has already received a number of offers, once she won ‘World Teen Supermodel – India’. The World Supermodel Production international event provides a global opportunity for young, ambitious women to put themselves into the national and international spotlight to be identified and applauded for being talented, articulate, fit and healthy – some of the key qualities of the modern woman, which deserve to be promoted and encouraged. As our very own Ashoi works towards doing our nation proud, let us do our bit in showing her our support as a community that commends her as an inspirational youth figure who is working hard to make her dreams come true! [Facebook: Ashoi Dantra / Instagram: @ashoi.d].